Biswajit Mishra received his B.Engg from National Institute of Technology (formerly MREC, Jaipur) in Electronics and Communication Engineering in 1996. He received both the M.S. and Ph.D. degrees in Electronic Engineering from the University of Southampton, UK, in 2003 and 2007 respectively. In 2007, he joined the University of Southampton as a Research Fellow working on Ultra Low Power and Subthreshod Circuits. 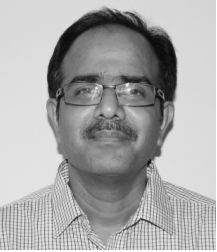 He moved to ESPLAB, EPFL, Switzerland in 2010 (till 2013) as a senior scientist prior to his one year as Assistant Professor at IIST, Thiruvananthapuram, India in 2009. In 2013, he joined DAIICT. Between 1996-2002, he has worked for Philips Semiconductors, India, UK, Switzerland and Cadence Design Systems in UK as R&D Engineer. His research interests include Ultra Low Power Circuits, Sub-threshold design methodology and system implementation for BSN and WSN and Geometric Algebra for image Processing.. Copyright © 2016 by Biswajit Mishra. All Rights Reserved.